Three McMaster researchers have been recognized for their work by the office of the vice-president, Research at this year’s Innovation Showcase. 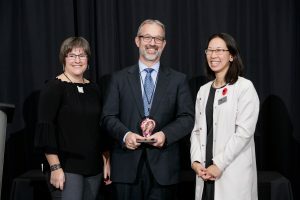 Hendrik Poinar (centre) with Karen Mossman (left), acting vice-president, Research, and Gay Yuyitung (right), executive director, MILO / Photo by Ron Scheffler for McMaster University. Hendrik Poinar, a molecular evolutionary geneticist and biological anthropologist in the department of anthropology, won the Synergy Award, which recognizes excellence in interdisciplinary research. As head of McMaster’s Ancient DNA Centre and as a member of the Institute for Infectious Disease Research, Poinar regularly collaborates on research projects across faculties, both at McMaster and internationally. 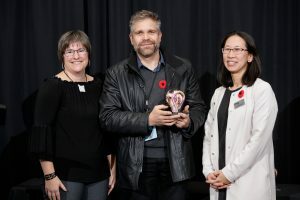 John Valliant (centre), with Karen Mossman (left), acting vice-president, Research, and Gay Yuyitung (right), executive director, MILO / Photo by Ron Scheffler for McMaster University. 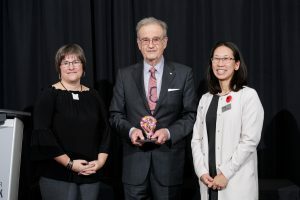 John Bandler (centre), with Karen Mossman (left), acting vice-president, Research, and Gay Yuyitung (right), executive director, MILO / Photo by Ron Scheffler for McMaster University. Finally, John Bandler, professor emeritus in the department of Electrical and Computer Engineering, received the Lifetime Innovator Award for his career’s worth of achievements, including a software company he founded that was purchased by Hewlett-Packard, and pioneering work in “space mapping” technology. Among many other professional accolades, he was named an Officer of the Order of Canada in 2016. 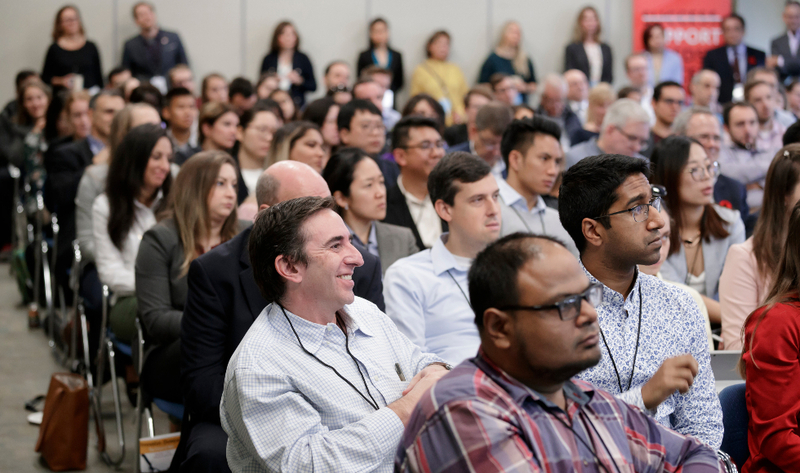 Hosted by the McMaster Industry Liaison Office, the Innovation Showcase connects researchers with industry and entrepreneurs who may be interested in turning research into commercial products and services.